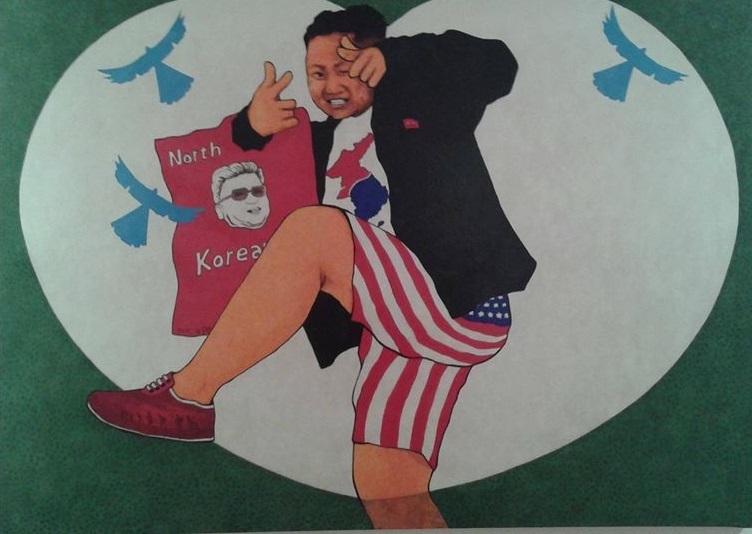 Connect: North Korea is delighted to announce a pre-launch event – the first exhibition held in the UK by North Korean exile artist Song Byeok. The exhibition will be available to view at Amnesty’s Human Rights Action Centre from the 8th to 12th of May. Song Byeok will also be speaking at discussion evening on the 8 May at SOAS. Bio: After being selected at age 24 to draw propaganda for the regime as an Official State Propaganda Artist, Song Byeok was disillusioned after famine struck North Korea, his home country, in the 1990s. He lost his parents and sister and was brutally tortured at the hands of the regime he once praised in his work, after attempting to escape North Korea to find food in China. He ultimately defected and arrived in South Korea in 2002, and now works as a satirist, using paintings to depict oppressive regimes and the people trapped within them—including many images of the dictatorship in North Korea. Song’s work has been featured in numerous exhibitions in South Korea, the United States (Washington D.C., Atlanta, Missouri, Iowa, and New York City, including at the US Congress and at the UN), and in Germany. He was also the basis for the main character in the South Korean indie film ‘Seolji’, about a North Korean defector painter. Two documentary films about Song Byeok have been produced, with a release date of early 2017 and early 2018.